Somehow, some way, we still don’t know if Johnny Manziel was partying in Las Vegas Saturday night, fewer than 24 hours before the Browns ended their season with a loss to the Steelers. To recap: USA Today has multiple named witnesses—including Phoenix Suns head coach Jeff Hornacek’s brother John—who place Manziel in Vegas Saturday night. After USA Today’s report came out, Manziel posted a photo of himself and his dog with the caption “#SaturdayNights,” and geotagged it Avon, Ohio. 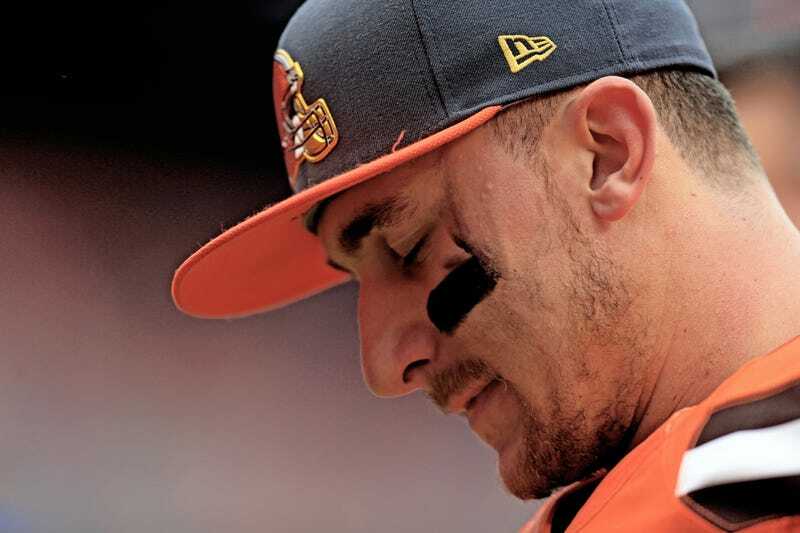 We know he made a Saturday morning appointment at the team facility but missed a Sunday morning appointment, and that this is almost assuredly the end of the road for Manziel and the Browns. Where In The World Is Johnny Manziel? Our sources tell us Manziel was at a popular night club on the strip Saturday night. The QB entered wearing a blonde wig, a fake mustache, glasses, and a hoodie. Manziel introduced himself as “Billy.” He was there into the 3am hour and when it came time to pay the bill, he asked to have it comped because he didn’t bring cash and also didn’t want to put it on his card. However, the sources tell us he ended up paying with his card and signing the check. Furthermore, ESPN Las Vegas reports that Manziel ate dinner in a private area (keeping the wig on), and sat at a dark VIP table in the club. Throw in the fact that photography is banned in casinos—especially anywhere near the blackjack tables Manziel was alleged seated at—and you can begin to imagine a scenario in which Manziel spends 12 hours in Las Vegas without anybody snapping a photo of him and selling it to TMZ. Now, as to why Manziel felt the need to (allegedly!) go to such elaborate lengths the day before the end of the season to (allegedly!) party in Vegas instead of just waiting until the offseason to party to his heart’s content? That question might be more difficult to answer.